Perfect for couples looking to relax on the beach, watch stars and have romantic sunset dinners, Angsana Balaclava is a unique island resort in Mauritius. The resort has a spectacular infinity edge lap pool, a seawater lagoon pool, Watersports Center and the world-famous Angsana Spa. Garden and Spa Suites have spacious outdoor decks, perfect for enjoying the surrounding nature. If you want to be right on the water, ask for one of the Beachfront Suites which are just steps away from the ocean. All of the suites have private pools. The 52 suites are decorated in a modern style which reflects Oriental, Occidental and African cultural influences. Set on a private stretch of a sandy beach, the Imperial Villa is the most luxurious. The two-story villa is comprised of two separate buildings and can easily accommodate a large family. Get massages in a specially designed spa treatment area and jump into the infinity edge pool while your kids play in the children's pool. The sprawling deck is perfect for family parties. Asian-inspired therapies at the Angsana Spa include Ayurvedic Tri Dosha treatments and hydrothermal therapies performed by trained therapists who studied in Academies in Thailand and China. Guests are invited to participate in the environmental rehabilitation and management of the local habitat. Activities include coral planting and guided snorkeling. Guests are encouraged to participate in the renewal and protection of the marine fauna and flora of Balaclava. Families with children have access to playground equipment, toys and enrichment activities delivered to your doorstep upon rebeach and pool games. Suites start at 468 Euro per night. 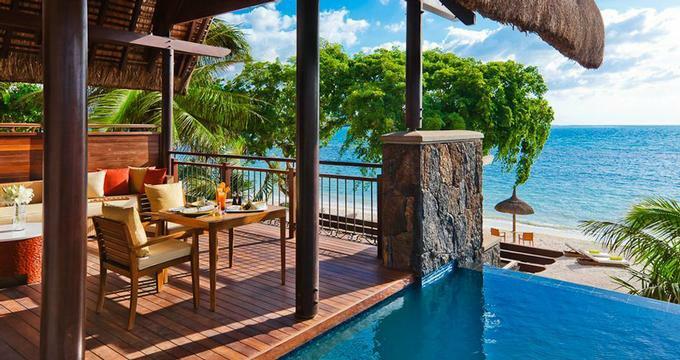 You may also like: 24 Most Outrageous Ocean Views from Your Hotel Bed.